People from the south of the US pickle watermelon rinds, while Thais cook them in curry. 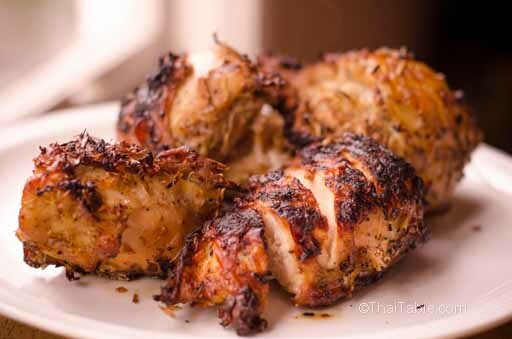 The texture and mild flavor are perfect for absorbing spices. 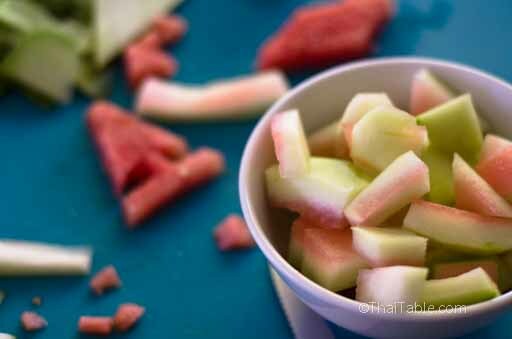 Next time when you have a watermelon, try watermelon rind sour curry. I didn't think about watermelon rind being edible until a friend was talking about it. When the green skin is removed, the light green rind is still hard, but can be bitten. It's texture reminds me of cucumber or winter melon but much denser, while it's taste is simply slightly sour, perfect for cooking or pickling. Pork Rice Porridge is such a comfort food in Thailand that serves well as breakfast or late night snack. It's filling but easy to digest since it's mostly water. The sick loves a bowl of hot porridge as well. When the Thais travel, they often pack instant rice porridge anticipating the unavailability of the food that they like. Instant rice porridge is handy, just add hot water which is usually available at most hotels. 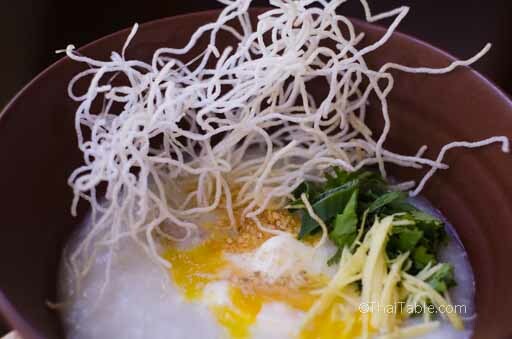 Rice porridge is an easy dish to make. You can make it from left over rice (great way to modify left over!) or start from uncooked rice. My tradition of eating rice porridge is rushing to eat all the crispy fried noodles before they turn soggy from the steam. The crunchiness of the noodles is almost as satisfying as the warm bowl of porridge with runny yolk. The julienne ginger brings extra heat to the tummy. Ahh...a warm bowl of rice porridge...a perfect comfort food. Thank you all for participating in the raffle and survey. We learned that the 3 most popular brands are Panasonic, Tiger and Zojirushi. And they are all equally popular. Jasmine and Japanese rice are both very popular. I'm surprised that about half of the people say they cook organic rice which is harder to find and also more expensive. It's great to hear how organic food is becoming a norm. If I could, I would love to cook organic jasmine rice every day. I'm happy to hear that every person say they cook rice at least once a week! But only half of the people own a rice cooker. If there is a rice cooker that you're curious about, please let us know, we'll seek one out for a review. 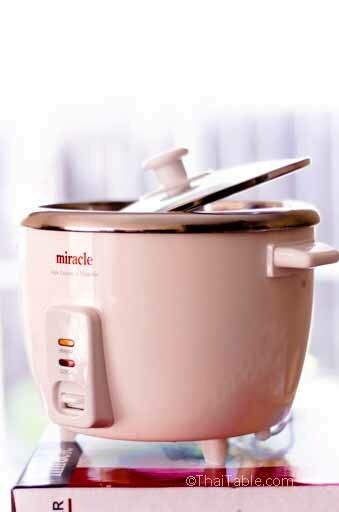 Our winner for this Miracle Exclusive rice cooker is ABJ from Massachusetts. Win this rice cooker! See details below. For the longest time, a standard rice cooker has had a metal inner pot with a Teflon coating. While the teflon is effectively non-stick, it scratches off and recently I have heard concerns about eating Teflon. Since I’ve also heard people are starting look at stainless steel rice cookers, I had to test one. 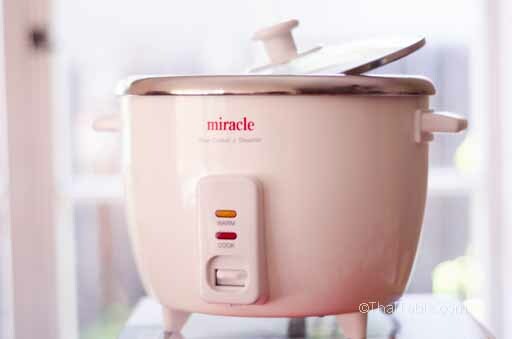 I contacted Miracle Exclusive and received an 8-cup rice cooker with stainless steel inner pot for testing. Please note that discussing food safety relating to cooking with Teflon is beyond the scope of this article. 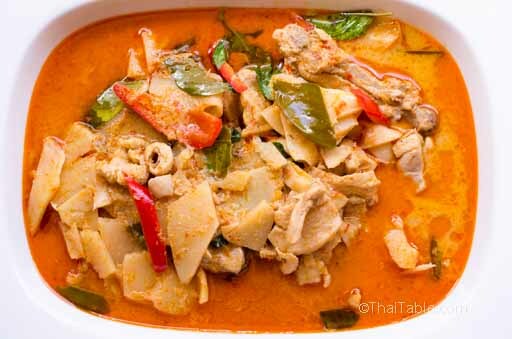 Sour Bamboo Curry is a curry that I make quite often because I love the subtle sourness of the pickled bamboo shoots that seems to tame the heat from the red curry paste. The previously pale bamboo shoot slices pick up some color and now sit pretty in a pot with floating red oil. The sour bamboo shoots absorb the spices while give up the pickling property to flavor the curry. The distinct taste and smell of Sour Bamboo Curry takes me back to Thailand. A street food hawker on a sidewalk with gigantic pots of curries and other dishes is sure have this Sour Bamboo Curry. The curry is often a favorite in cafeterias. But you rarely find the curry in Thai restaurants inside or outside of Thailand. When I make Sour Bamboo Curry, at lunchtime, I sit down with a plate of rice, Sour Bamboo Curry on top and a chili fish sauce on the side. I'm tasting home again. Outside of cosmopolitan Bangkok, bamboo groves grow along the edges of rice fields, around people's homes, in the woods and up on the hills. The shoots are cut and trucked into Bangkok in the middle of the night. They're ready for chefs and housewives early in the morning when the markets convene. Some of the harvest turn into pickled bamboo shoots or Sour Bamboo shoots. 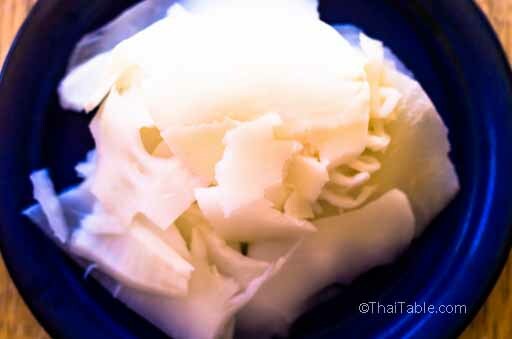 A young bamboo shoot is sliced thin and pickled in a simple brine of water and salt. It takes about 3 days to 2 weeks for the pickle to mature. The pickled shoots don't smell or look very attractive but the extra dimension that the pickling process brings out makes Sour Bamboo Shoots an important ingredients in several dishes such as Sour Bamboo Curry and Southern Sour Curry. A good sour bamboo should not have a strong sour smell. The bamboo should be thinly sliced and tender. They come in a plastic and glass jar in a clear brine. A Thai riddle: what has 2 legs walking but when stops and settles down has 6 legs? South Asian immigrants in Thailand seem to monopolize the fried bean street food business. When I was growing up, a South Asian man would walk around carrying a small table with long legs on his head. The table had sections, each filled with various fried beans along with chopped green onion, chili pepper and salt. When you'd ask him for some beans and he'd take the table off of his head, set it down and get out a small plastic bag. You could choose from fried mung beans, fried peanuts, fried fava beans and fried peas. My favorite is the fried mung beans. 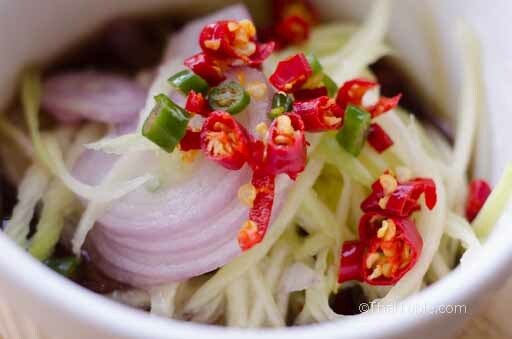 The crunchiness of the beans mixed with the aroma of the green onion and chili peppers make them addictive. Each bite is a little salty and spicy. I can inhale a little bag of 3-5 teaspoons in no time. Now in the 21st century, the South Asian immigrants still monopolize the fried bean business. The table, though, is gone, replaced with a plastic basket. The sight of a bean vendor with plastic basket is not as romantic as the table, but the fried beans are as addictive as ever. One of the questions that we get from many people coming back from vacationing in Thailand is about the fish sauce with chili pepper. You'd often see the a jar of fish sauce with sliced of tiny red and green chili peppers floating inside, sitting on a table at Thai eateries. 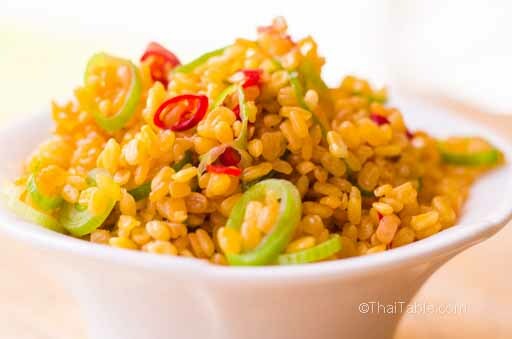 To the Thais, chili fish sauce is our number one must-have condiments. No matter how tasteless the food is, the chili fish sauce will magically make everything delicious. Green Mango Chili Fish Sauce, based on chili fish sauce, has the addition of shredded green mango and lime juice. 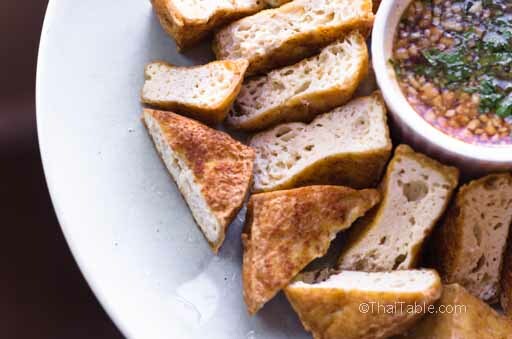 This variation makes a great universal dipping sauce or a base for Thai salad dressing. If you ever wonder what an average Thai eats at home, and if you could peer into their windows, you would often see a grilled catfish, fried fish or dried smoked fish eaten with this Green Mango Chili Fish Sauce. A Thai living abroad like me relishes Green Mango Chili Fish Sauce whenever I can get my hand on a green mango. With a bowl of rice, fried egg and this sauce is a meal I'm content. Many people shy away from serving tofu due to the monotonousness of the bland taste. But Fried Tofu makes use of its tasteless white flesh. In this dish, the tofu serves as a building block in bringing a colorful, flavorful sauce that makes the blandness a welcome complement. The white smooth tofu is transformed after frying into golden, spongy goodness dressed with spicy peanut dipping sauce. The white spongy texture holds the sauce so well that each bite becomes an addictive contrasts between the tofu and the spicy, sour and nutty sauce. Fried Tofu is a big hit among my vegetarian and vegan friends.